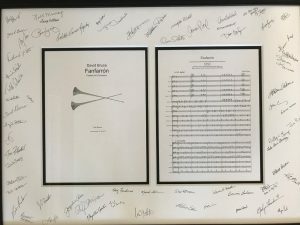 I was honoured to be asked by San Diego Symphony to write a celebratory fanfare in honour of their departing maestro Jahja Ling, who conducted the premieres of my Night Parade and the Violin Concerto Fragile Light. The former of these pieces Jahja also brought to Carnegie Hall for the orchestra’s debut there, as well as on their tour of China in 2013. I enjoyed working with Maestro Ling, who had a firm but gentle approach, and the orchestra has clearly flourished under his tenure, with a raft of excellent younger players joining and creating his legacy for the future. The fanfare is a 3 minute work for full orchestra. It’s called Fanfarrón, the Spanish word, said to be the origin of the word ‘fanfare’, which translates roughly as ‘show-off’ or ‘loud-mouth’ – a reference to the character of the music of course, rather than the man himself, who is anything but!